+$Sign up for a generate workshop today. 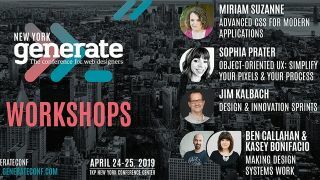 +$Alongside a host of top-quality speakers, generate NYC 2019 brings with it four expert workshops. Set in the salubrious surroundings of the TKP New York conference center on +$109 West 39th Street, the web designer conference is only 10 +$minutes from Grand Central and Penn Station. +$First up we have ‘Making Design Systems Work’ withGirlscancode.io+$creator Kasey Bonifacio andSparkbox+$founder Ben Callahan. +$Next, +$author and CX aficionado+$Jim Kalbach+$brings you his Design & Innovation Sprints workshop. +$There's also a workshop from+$Sophia Prater+$, who is running her Object-Oriented UX: Simplify your pixels and your process workshop. +$The final workshop is brought to you by+$Miriam Suzanne+$with her Advanced CSS for Modern Applications workshop. +$Don’t forget to book today atGenerateconf.com+$to make sure you don't miss out. See you there!